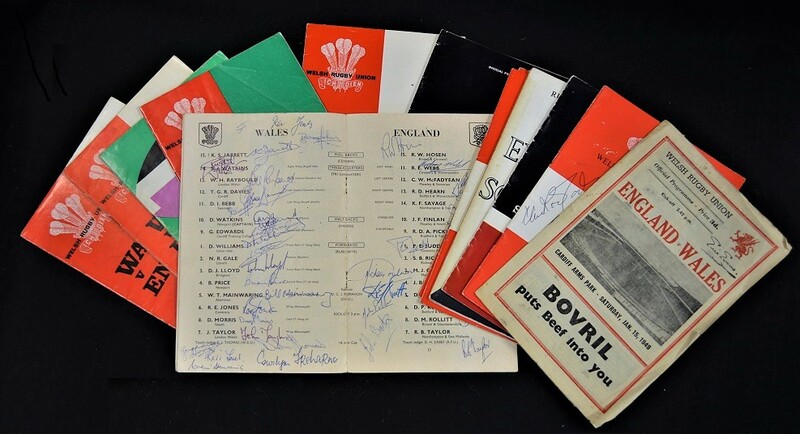 1949-1969 Wales Rugby Programmes etc, some signed, from 'Special Occasions' (13): v England 1949 (first post-war win over England in capped match), 1963 (frozen, signed by debutant & Captain Clive Rowlands, last English win over Wales till 1974), 1965 (Wales Triple Crown season), 1967 (Jarrett's Match, 2, one heavily autographed by teams) and 1969 (2, Wales Triple Crown, M Richards 4 tries); v Ireland 1965 (Triple Crown & denied Ireland), 1969 (Triple Crown, Price's punch on Murphy); Scotland v Wales 1963 (Rowlands' 111 lineouts!) 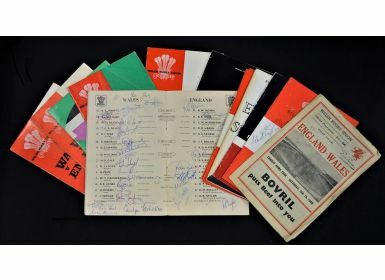 & 1969 (Triple Crown); France v Wales 1969 (Edwards' try, Triple Crown); plus England v Scotland 1963 (Sharp's dummying try). Good or better, fine selection.